You'll love this quaint, cozy historic cabin. You might take a hike or ski for the day before coming "home" to this cute cabin. Perhaps enjoy the wildlife in the park right outside your front door. If you want to vacation under the Milky Way and literally wrap yourself in a little slice of Montana heaven this cabin will do the trick. Once you are tucked in for the night this peaceful little home will calm your nerves and the hot tub will take care of those sore muscles. If you feel like venturing out downtown Red Lodge sits only 5-6 blocks away and offers shopping, fine dining, great wine selection and local micro brew! Come enjoy Red Lodge and have fun at Wild Bill Cabin! I did not need to work with any person to book or enjoy my stay at the cabin. Realy pleasant quiet cabin. Very cozy. "Perfectly Relaxing Getaway This cabin was awesome! Sooo much better than the pictures that are on the website. Totally cozy, clean, quaint, and comfortable. We took several hot tubs each day, which was also much better than I anticipated. The location is very convenient. On the edge of town so it is very private. A nice walk to the downtown area of Red Lodge if the weather is nice. We also came in the ""off season"" so there were many less travelers around, making the experience even more relaxing. I would recommend this cabin to everyone, even to my pickier friends and family. This place won't disappoint!!! " "RELAXING LIL CABIN MY FRIEND AND I STAYED AT THIS CABIN FOR MY 40TH BIRTHDAY. IT WAS STILL COLD AND SNOWY, AND WE ARRIVED THE STOVE WAS GOING........ :-) IT WAS VERY COZY AND CLEAN. IT HAD EVERYTHING WE NEEDED. THE HOT TUB OUTSIDE WAS A BONUS. I WOULD GO BACK AND STAY AT THIS CABIN IN A HEATBEAT "
"It was a fabulous weekend getaway! The service was great they called to ensure we got in with out any trouble. The cabin was amazing, perfect for the two of us. We had all the amenities we needed. The cabin was clean, there were plenty of linen's for showering and for the Hot Tub! It was a blast to be sitting in the middle of a lot of snow and relaxing in the Jacuzzi. It was one of my favorite memories. The cabin was close to town, it had a lot of great places to shop, eat and drink. The ski lodge was amazing and a short drive, they have great food and customer service! I did not want to leave it was a perfect Valentines weekend. One other thing i really loved was that they had a vacation journal in the cabin where you can makes notes on your stay and i loved reading others comments, it was fun to read and share the memories they made and ideas or suggestion they had for the next people, and we did hit up some of those locations.. I recommend you definitely make a trip to Red Lodge and book your trip with aAa Red Lodge Rentals *** "
"Authentic, romantic, cosy and relaxing I was visiting from australia so to experience snow at the doorstep was so amazing! The cabins atmosphere was warm, cosy and inviting. Especially loved curling up on the couch with my fianc and a glass of wine in front if the fire...the hot tub was also an amazing experience, outdoors, in the snow...loved it! 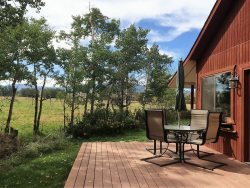 Would highly recommend Wild Bills Cabin and would love to return again...it has everything you need for a self catered, romantic getaway... "
"Don't judge this from the outside We thoroughly enjoyed our stay @ Wild Bills Cabin. It was clean, comfortable and within walking distance of downtown Red Lodge. Nicely decorated. We used the cabin as our base for day hikes. It was a great place to relax at the end of the day. We highly recommend the hike to September morn lake! " "Wonderful weekend getaway We went to Red Lodge to visit family around the area and chose to stay at the Wild Bill's cabin instead of a hotel and were happy that we did. It is in a quiet part of town and a beautiful setting. There are so many good places to eat, Grizzly Bar in Roscoe, Bearcreek bar and steakhouse w/ the pig races, and the Edgar Bar (we went for the first time, and would highly recommend it). The one thing we liked about the cabin was having a hot tub to ourselves. It was decorated inside somewhat like our home and it was peaceful. I thought the extra for the cleaning fee was a little much, but other than that we enjoyed our stay. " "Everything we hoped for. It was just what we wanted. Close to town, cozy, cute, & comfortable. That mattress was awesome, we slept great! We'll be back for skiing this winter! " "General Opinion Cabin in general was very nice and in excellent location. Only negatives were a need of step stool to get in and out of hot tub. Front door and screen door need a little attention. Back door needs to be put back into use, for emergency purposes. Fridge makes noises but works fine. Service person was very quick to respond to a need we had and was very friendly. Response Glad you enjoyed your stay. Thank you for your feedback, it is very important to us. We will be happy to address the hot tub stool and the doors. "